A little education can go a long way. It can vault someone into a higher-paying career, help people understand different cultures and keep them off the streets. It can also help reduce car theft. Auto thefts in Toronto have been dropping steadily for the past few years, according to figures from the Toronto Police Service. In 2007, a grand total of 8,506 vehicles were stolen in the city, while in 2008, thieves made away with 6,687, a 21 percent drop from the year before. And, so far this year, there’s been a further 20 percent decrease with 4,175 vehicles stolen as of Oct. 13. Const. Wendy Drummond of the Toronto Police Service’s public information unit says this is likely because of increased knowledge of car theft and more focused policing. Thanks to information campaigns in the winter, more people know that thieves often steal cars when owners leave them running in their driveways with the keys in them, she adds. Drummond says Torontonians are also more aware of another type of auto theft that begins with a theft in their houses. Most of the new housing developments in Toronto also have secure parking garages to keep cars, which have also helped reduce theft, Drummond adds. But there is one area where all drivers, not just ones from Toronto, could use a little more education – auto insurance. In Ontario, there are mandatory types of auto insurance coverage and optional ones. Drivers need the mandatory coverages to drive legally in the province since they protect you if you’re injured in an accident or at fault in a collision. But James Geuzebroek, manager of media relations at the Insurance Bureau of Canada, says the mandatory coverages do not cover auto theft. To be covered if your car is stolen, you need to get comprehensive coverage, Geuzebroek says. And, while Geuzebroek says most people know they need different kinds of coverages to protect against auto theft, there are still many who probably don’t. “It’s true that many people just . . . don’t understand auto insurance well, so it is always a good idea to take the time to talk to your insurance provider and make sure that you do have the coverage that you want,” he says. Geuzebroek says comprehensive coverage will give you the value of your car if it is stolen and not recovered, even if your car is left unlocked. However, comprehensive coverage is probably only worth getting if your car is worth stealing, he adds. That cost varies depending on the make, model and year of your car and the kind of neighbourhood you live in, Geuzebroek adds. He says if someone makes a claim in a neighbourhood where auto theft is rampant their rates will probably go up. However, if a car is stolen somewhere where auto theft is rare, a claim likely won’t have an affect. Also, there is one thing about auto theft coverage, in particular, most people don’t know. If things are stolen from your car, unless they are auto accessories, they aren’t covered by auto insurance but by either home, condominium or tenant’s insurance. And some companies need evidence of a break-in to cover the theft, so if your car was left unlocked, you may be out of luck when making a claim. Geuzebroek says many people don’t know items in their cars aren’t covered because most people don’t read up on their insurance. 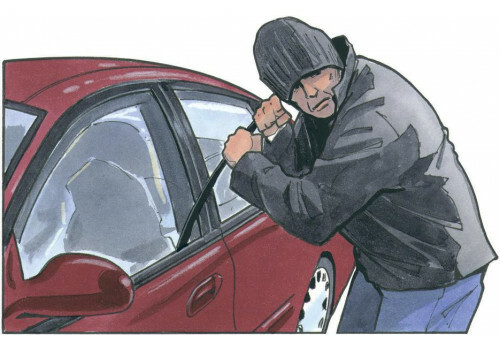 To avoid getting stuff stolen from your car, both Geuzebroek and Drummond suggest keeping items, especially expensive electronics, cash, gifts and clothing in your home or at least out of sight. And, of course, keeping your car locked is always important.